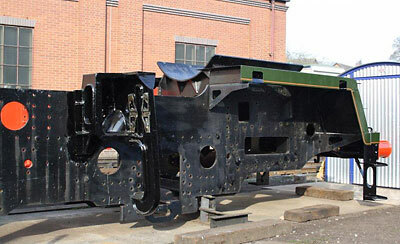 The front footplating has been completed for now although some shaping of the upper centre section will be needed when the smokebox is fitted. The front footsteps are in position with some work remaining on the rear steps and the cab steps. 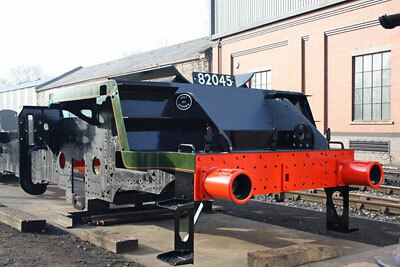 The manufacture of the injector mounting brackets is closely associated with the cab footsteps on the fireman's side and is therefore underway. The left hand side motion bracket is at the machining stage of its manufacture. Machining of the manganese liner plates continues. We already have bolts for attaching these plates to the horn guides but will have to make some for the horn blocks. We are glad to report a healthy bank balance at the time of writing: the money for the complete cylinder job (pattern-making, casting and machining) is in hand. 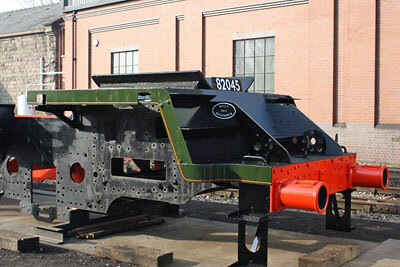 We are also very pleased with the response to the SVR News wheel appeal which went out earlier this month and has been a success, with monies still coming in, the fund is already approaching the half-way point for having the driving wheels cast. Watch out for a full-length feature article and appeal leaflet in one of the leading hobby magazines towards the end of April, designed in the hope of bringing in new members from outside the Severn Valley Railway. A last-minute reminder that the AGM takes place this coming Saturday (31st) in the upstairs lecture theatre at Kidderminster Railway Museum, starting at 2.30 p.m. Hope to see you there! Sales of model railway items are a great way of raising funds for 82045. If you are having a clear out, please remember us. Contact Barbara for collection/delivery arrangements. Thank you! Take a look at our sales page where our new Gomm badge is shown. This high quality lapel badge is a great way to show you are supporting 82045 and is available by post from Barbara. Full details are on the sales page and order form.